Israeli election: Netanyahu wins big, his scorched-earth campaign tactics worked. Israeli Prime Minister Benjamin Netanyahu and his wife, Sara, wave to supporters on March 17, 2015 in Tel Aviv. In the end, it wasn’t even close. 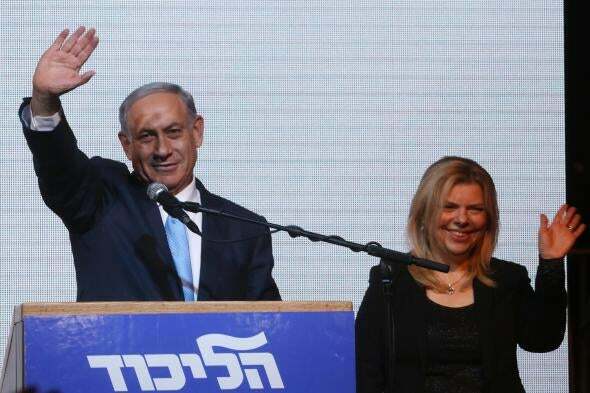 Tuesday night most Israelis went to bed with early exit polls showing Prime Minister Benjamin Netanyahu’s Likud party running neck-and-neck with the rival Zionist Union, comprised of Isaac Herzog’s Labor party and Tzipi Livni’s Hatnuah. That, in itself, was a surprise: Polls leading up to Election Day showed Netanyahu four seats behind. But Israelis woke up to find that Netanyahu won handily. With 99 percent of the vote in, Likud will take an estimated 30 seats in the 120-seat Knesset, compared with Zionist Union’s 24. The big question now is whether the polls were wrong all along, or if Netanyahu’s scorched-earth campaign tactics in the closing days of the race—including pledging never to allow a Palestinian state, and a race-baiting warning to supporters about Israel’s Arab citizens voting in high numbers—tipped the scales in his favor. Either way, these statements, as well as his controversial speech to the U.S. Congress earlier this month, don’t appear to have lost him support, and very well might have gained him some. They will certainly have an impact on his tenure going forward: Senior Palestinian Authority officials have said that the election results prove Israel can’t be a partner for peace. The already dysfunctional relationship with the Obama administration is likely to get even worse. The other big story of the night is the United Arab List, a new coalition of smaller Arab parties, which received 14 seats, becoming the third-largest party in the Knesset. Supporters hope this marks the beginning of a new era in which Arab parties are an active opposition force in the Israeli government. If so, it’s a development ironically sparked by procedural efforts to block them from government and Netanyahu’s divisive rhetoric. There’s still some talk of a unity government, and Zionist Union leader Herzog hasn’t said for sure whether he would join a coalition with Netanyahu, but senior members of his Labor Party say they expect to go into the opposition once more. That means the prime minister’s new government is likely to be dominated by right-wing and ultra-Orthodox parties, exactly the scenario he had in mind when he blew up his last coalition and called for new elections last December. This feels a bit like déjà vu. Back in 2013 it was TV host-turned-politician Yair Lapid who, after a surprisingly strong showing following a campaign emphasizing economic issues, got to play the role of kingmaker, and took the post of finance minister in Netanyahu’s government—which the prime minister has already offered to Kahlon. But the differences between the two on social, national security, and economic issues proved irreconcilable and Netanyahu fired him last December, setting up this race. In other words, while Israeli voters may have chosen continuity, there’s a good chance they’ll be voting again pretty soon.